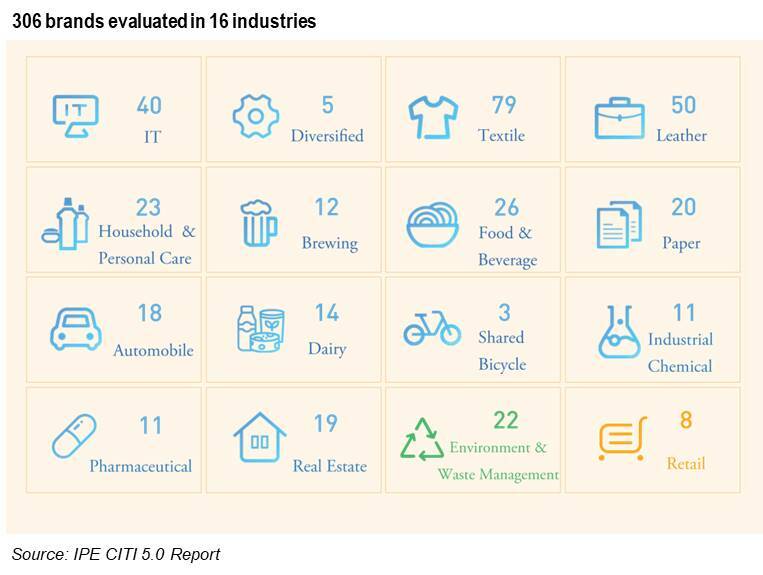 This year’s report evaluated 306 brands across 16 industries, with the addition of two new industries: retail, and environment and waste management, including companies that invest in waste incineration. In general, brands are included in the report scope if they are suspected of having pollution in their supply chain and have already been contacted by environmental NGOs. CITI 5.0 also ramped up its evaluation standards from last year, increasing requirements for the timeliness of supplier response, rectification, and disclosure. The evaluation criteria cover five areas: responsiveness and transparency, compliance and corrective action, extended green supply chain practices, energy conservation and emissions reduction, and performance disclosure. Each of these areas and their indicators may be tackled in sequence, thereby providing a roadmap for brands to effectively adopt environmental supply chain practices. Three US brands, Apple, Dell, and Levi’s topped the charts in first, second, and third place for the second year in a row. Apple has now held first place for all five years of the CITI evaluation, with 84 out of 100 total points. Since 2014, Apple has maintained its high score by pushing a total of 157 of their suppliers in China to voluntarily disclose environmental information, and more recently, the company achieved 100-percent renewable energy in its direct operations worldwide, with at least five suppliers sourcing from China committed to the same goal. 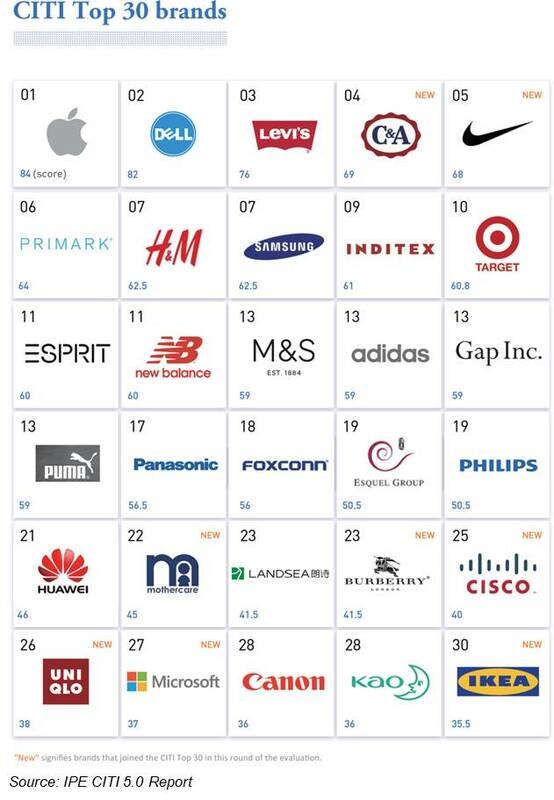 Samsung was the only other brand to hold its place among the Top 10, joined by consistently high performers Primark, H&M, Target and Inditex (previously listed as ZARA) this year. The most notable entrants to the Top 10 were apparel brands C&A and Nike, both of whom leapt from CITI scores in the mid-30s up to the high-60s, demonstrating immense work over the past year. Nike moved well beyond the first few evaluation areas of disclosure and corrective action by using Blue EcoChain and working with direct suppliers to extend pressure for environmental compliance upstream, not to mention reducing the energy required to produce a pair of shoes by nearly 20-percent since 2015 through its Energy Minimum Program. Among the Top 30, Foxconn, Esquel and Huawei continue to outdo their competitors from Greater China, now ranked in this top cohort for five straight years. Similarly, amid leaders in the IT and apparel industries, Landsea and Kao exemplify longstanding commitments to responsible procurement, earning more than double the scores of the No.2 brands in the real estate and household & personal care industries, respectively. Landsea Green Group also paves the way for others in the industry by supporting the China Real Estate Industry Green Supply Chain Action coalition, and taking deliberate steps to include environmental compliance requirements in its centralized procurement bidding documents. However, it is important to note that only 20 brands out of 306 reached the halfway mark of 50 points. Although this number includes five more brands than 2017, relatively few mid-tier performers demonstrated year-on-year improvement, demonstrating the need for more momentum amid increasing pressure from central government inspections. 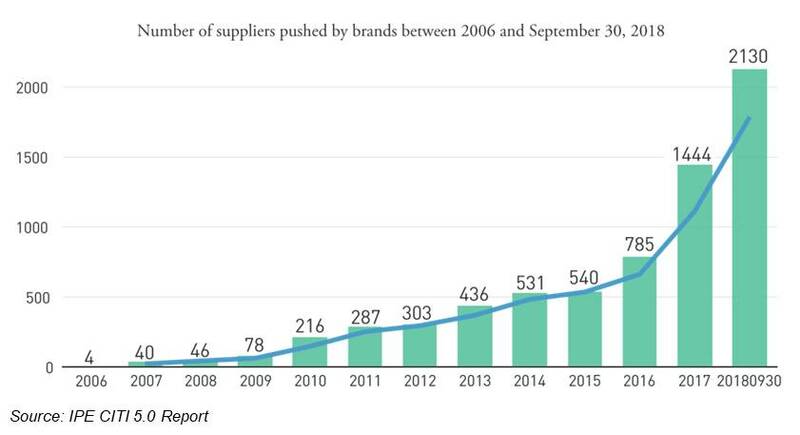 Over the past twelve months, Chinese and international brands have pushed 2,458 suppliers to respond to their environmental violation records by disclosing related information or taking corrective action. Among them, a total of 1,508 suppliers gave public explanations for their records, demonstrating active acknowledgement and response. With 38 brands using Blue EcoChain and 55 brands using the Blue Map Database on a quarterly basis or more frequently, leading brands have pushed their direct suppliers to extend green procurement both upstream and downstream; this evaluation period consequently witnessed more environmental action from suppliers close to raw material production and waste disposal than ever before. 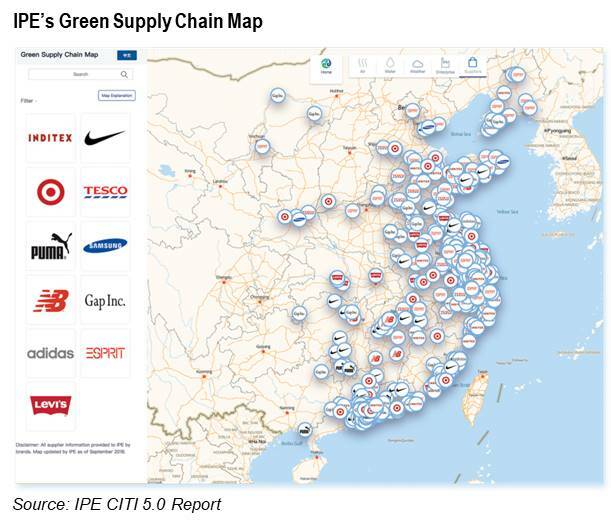 Eleven brands also took the additional step of publishing their entire list of suppliers in China on IPE’s Green Supply Chain Map, openly tying their logo to the performance of their suppliers, many of which offer real-time air and wastewater emissions data. As of October 2018, ten textile brands – Adidas, Esprit, Gap Inc., Inditex, Levi’s, New Balance, Nike, PUMA, Target, and Tesco – and Samsung have taken this landmark step for brand transparency and accountability. 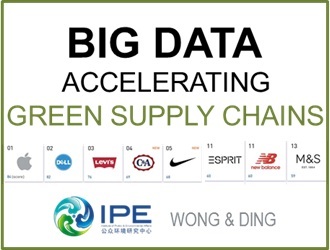 Given the critical importance of climate change, this year, IPE released an extension of the CITI report that focuses directly on brands’ management of greenhouse gas (GHG) emissions in their supply chains in China – the Supply Chain Climate Transparency Index (SCTI), developed in partnership with the Carbon Disclosure Project. 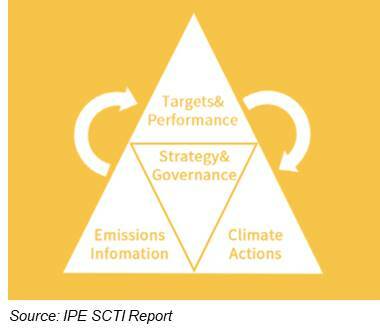 The SCTI evaluation is founded on the understanding that supply chain emissions outside of direct operations account for over 75-percent of a company’s overall emissions in most industrial sectors, with the goal of providing a similar roadmap to CITI for brands to follow. 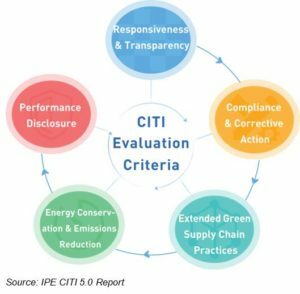 Based on findings from this CITI evaluation, IPE recommends that the government add to the existing foundation of past regulations for open information to mandate the disclosure of pollution, emissions, climate and energy data by companies and suppliers in China. Financial Institutions, in partnership with the government, are recommended to incorporate green supply chain performance standards into their development of China’s green finance system, which will eventually unlock market power to boost companies with sustainable procurement practices. To date, IPE has collected over 1.2mn environmental violation records in its database of publicly available information, growing in tandem with China’s environmental law enforcement. In light of increasing government pressure and intensifying climate change, brands would also do well to adopt available data-based solutions such as Blue EcoChain to ensure effective monitoring up and down their supply chains. Public data can and will form the essential foundation for green finance and carbon trading but information disclosure is only possible with collective action nationwide toward climate mitigation and pollution reduction.